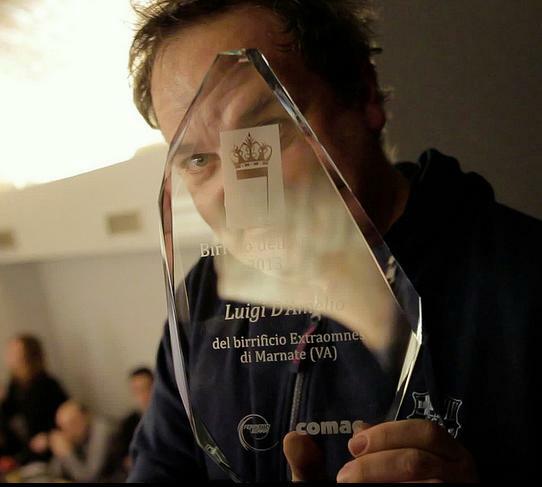 Luigi D' Amelio from the brewery “Extraomnes” of Marnate, in the province of Varese, has won the title of “2013 Brewer of the Year”, an award created and organized by the network Fermento Birra that has involved more than fifty jury between professional tasters and experts. Despite the young productive age (2010), Luigi D' Amelio has won thanks to his beers’ personality that draws on the best modern expressions of the Belgian beers as De Dolle, De Ranke, De La Senne, intriguing and complex beers, always characterized by their initial freshness, a final dryness and a dangerous smoothness. For example the Blond, with its scents of citrus and spices, or the Zest, characterized by the explosive bouquet of exotic fruits, both with the final sharp bitter typical of Extraomnes. Or thick beers like the Straff, the Tripel, the Christmas Kerst, or the Saison, enhancing the hoppings integrated with the spiciness of the yeast. Many other new beers in 2013 that have had immediate success as the saison Wallonie, the floral Hopbloem flavored with the exotic leaves of Combava, the mighty Quadrupel, as other beers aged in barrels like the amazing Weltanschauung, an oud bruin aged 20 months in oak barrels or special beers such as Donker, an imperial stout flavored with Ethiopian coffee . Although the brewery is headed by El Mundo , a coffee company in the Varese area, Extraomnes is a creature of Luigi D'Amelio. Today the brewery produces fifteen labels bottled in 33cl format, all top-fermented Belgian mold. 1000 hl beer produced annually by a 10hl plant and a 170hl cellar.